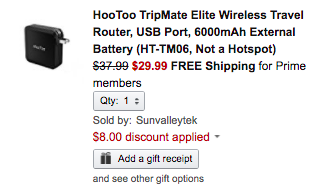 Sunvalleytek (99% positive feedback from 244,000 reviewers) via Amazon offers the HooToo TripMate Elite 802.11n Wireless Travel Router with 6000mAh Power Bank for $37.99. Applying coupon code BDXJHPHF drops the final price to $29.99 Prime shipped. That’s good for $8 off the regular price and the lowest that we’ve tracked on this model. It’s never a bad idea to have a wireless router on-hand, especially if you’re an avid traveler. HooToo’s TripMate Elite goes a step further with a built-in 6000mAh power bank, dual USB ports and the ability to stream files/media to your devices. Furthermore, this model supports 802.11n speeds and it can act as a router or bridge. Over 200 Amazon customers have left a 4.1/5 star rating.